A Professionally Designed Seasonal Bouquet, cut just days before you receive it. You'll receive top quality blooms and greens, shipped overnight to ensure freshness - Bouquets you'll be proud to give. Our Monthly Newsletter where you'll learn about each featured flower's history, where it originated and how it was grown. Each month, The Fresh Cut Flower of the Month Club delivers a breathtaking seasonal floral arrangement, accompanied by our entertaining and informative newsletter. Each bouquet includes several featured flower varieties and accompanying greens, plus floral food to keep each bouquet looking great as long as possible. With over 60 years collective experience in all aspects of the floral industry, our designers know which flowers travel best, where to find the best quality blooms and when to buy them. 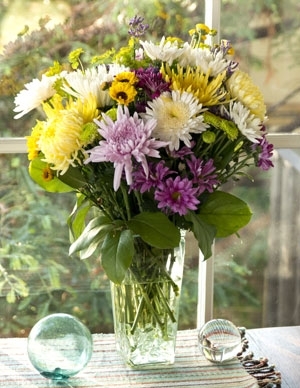 Overnight delivery ensures your flowers arrive just after they’re harvested. All flower growers offer several levels of quality for each species; you can rest assured that we purchase only the best quality for each featured arrangement, ensuring sensational blooms. We receive our flowers just 1 day after they're cut, which is much sooner than most local flower shops. Our bouquets are assembled and packed that day and shipped Next Day Express Service in a box designed especially for floral arrangements. Additionally, each stem is cut before the bud blooms, which ensures they'll travel much better and will begin blooming 2-3 days after you receive them, ensuring your bouquet enjoys a long vase life! With over 60 years collective experience in all aspects of the floral industry, our designers know where to find the best quality blooms, when to buy them, and which flowers travel best. Flowers are graded by a number of factors including the actual size of the bloom, its luminosity, color vibrancy, stem strength and sturdiness, bloom count per stem, and how much the bloom has opened. We purchase only top quality blooms from highly respected farms. We’ve traveled extensively to top flower growing regions in Colombia, Equator, Costa Rica and Holland visiting and touring farms and meeting their owners. We’re inspecting post flower harvesting facilities, ensuring that proper refrigeration and hydration systems are in place, and verifying that strict grading systems are maintained. Absolutely critical to consistently delivering quality floral products are the relationships we’ve developed over the years. They ensure that quality will not suffer when Mother Nature doesn’t cooperate and other buyers have to settle for inferior blooms. All flower types thrive in different climates and knowing where to buy each type is key to maintaining our high quality standards. We buy orchids from New Zealand and Thailand, Lilies from Ecuador and Holland, and proteas from California’s high deserts. I gave a membership to my mom on her birthday a few years ago… Mom raved about the flowers every month. For over 20 years, we’ve been delivering beautiful and exotic freshly cut flower bouquets, perfect as memorable gifts for all the flower lovers in your life. With a Fresh-Cut Flower of the Month Club membership, your gift will be appreciated long after the first shipment arrives! It’s Not Just Flowers – It’s a Flower Experience! Our goal is to make each flower club gift membership a true “experience” gift. Your gift recipients will anticipate the joy of receiving a new bouquet each month, and not only will they love they flowers themselves, they’ll also enjoy learning of the origin and history of each featured flower species. Warming the hearts and homes of our members with gorgeous and top-quality fresh flowers has been our passion for over 20 years, and we can’t wait to share the fun of receiving these beautiful bouquets with your gift recipients in the months to come! During checkout, you’ll have the option to schedule an email gift announcement for any date you choose, or create a PDF that you can print out and give to your gift recipient. It’s the perfect solution for those of you who are in panic mode! Just order your flower club gift membership to start with the next available shipment, and email or print a gift announcement today! I lead our team of professional floral designers in creating exotic and artistic bouquets you’ll be proud to give.